Excluding items affecting comparability the operating result was SEK 22.7bn and return on equity 12.7 per cent. The operating result for 2017 amounted to SEK 20.8bn (14.9) and the return on equity was 11.5 per cent. "During the year, all customer segments increased their activity levels and there were positive macroeconomic signs in all our home markets. We are well positioned to continue to create customer value and profit growth. 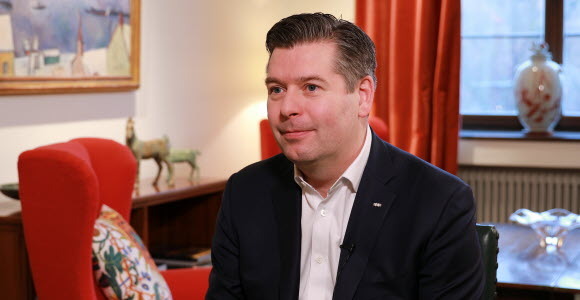 We aim to deliver on the last year of our current business plan and remain committed to our cost cap of SEK 22bn for 2018", says Johan Torgeby, SEB's President and CEO, commenting on the annual accounts. Operating profit before items affecting comparability for the fourth quarter 2017 was SEK 6.1bn (5.4). Operating profit for the fourth quarter 2017 was SEK 4.2bn (5.4). Compared to the fourth quarter 2016, operating profit before items affecting profitability increased by 10 per cent. Return on equity was 8.8 per cent (12.1) while return on equity before items affecting comparability was 13.5 per cent (12.1). Operating income for the fourth quarter amounted to SEK 11.9bn (11.1). Compared to the fourth quarter 2016, operating income increased by 2 per cent. Operating expenses amounted to SEK 5.6bn (5.4). Compared to the fourth quarter 2016, operating expenses decreased by 2 per cent. Asset quality remained strong. The net credit loss level was 3 basis points for the quarter (7). The liquidity coverage ratio was 145 per cent (168 one year ago). The capital position improved with a Common Equity Tier 1 capital ratio of 19.4 per cent (18.8 one year ago). SEB's own assessment of the CET1 requirement, including the maturity floor and corporate risk weights, was 17.2 per cent. The Board of Directors proposes a dividend to the shareholders of SEK 5.75 per share (5.50) for 2017. You can download the Annual Accounts, Press Conference Presentation and Fact Book from https://sebgroup.com/investor-relations/reports-and-presentations/financial-reports. This is information that Skandinaviska Enskilda Banken AB (publ.) is obliged to make public pursuant to the EU Market Abuse Regulation. The information was submitted for publication, through the agency of the contact persons set out above, at 7 am CET, on 31 January 2018.